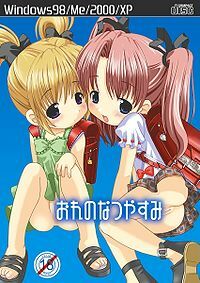 Ore no natsuyasumi (おれのなつやすみ My summer vacation) is a Visual Novel erogame released in December 2002 by Private sakuranbo elementary school or Kodomo-H as the circle is known in the wide public. It was the first game released by them. In February 2011, the LAH Team has picked the game up for translation. This page was last modified on 19 April 2011, at 11:33. Content is available under Attribution-Noncommercial 3.0 .